Nr. 1 Arie: "Hier soll ich dich denn sehen" ... "Aber wie soll ich in den Palast kommen?" Nr. 2 Lied und Duett: "Wer ein Liebchen hat gefunden" "Verwünscht seist du"
Nr. 3 Arie: "Solche hergelaufne Laffen"
Nr. 4 Rezitativ und Arie: "Konstanze, dich wiederzusehen O wie ängstlich, o wie feurig"
Nr. 5b Chor der Janitscharen: "Singt dem großen Bassa Lieder"
"Immer noch traurig, geliebte Konstanze"
Nr. 6 Arie: "Ach ich liebte, war so glücklich"
"Halt ein, nicht ein Wort!" ... "Herr! Verzeih, dass ich es wage" ... "Triumph, Triumph, Herr!" Nr. 7 Terzett: "Marsch, marsch, marsch! Trollt euch fort!" "O des Zankens, Befehlens und Murrens"
Nr. 8 Arie: "Durch Zärtlichkeit und Schmeicheln"
Nr. 9 Duett: "Ich gehe, doch rate ich dir O Engländer! Seid ihr nicht Toren"
"Wie traurig das gute Mädchen daherkommt!" Nr. 10 Rezitativ und Arie: "Welcher Wechsel herrscht in meiner Seele"
"Traurigkeit ward mir zum Lose"
"Mein bestes Fräulein, noch immer so traurig?" ... "Nun, Konstanze, denkst du meinem Begehren nach?" Nr. 11 Arie: "Martern aller Arten"
Nr. 12 Arie: "Welche Wonne, welche Lust"
"Dass es schon vorbei wäre" ... Nr. 13 Arie: "Frisch zum Kampfe! Frisch zum Streite!" Nr. 14 Duett: "Vivat Bacchus! Bacchus lebe!" "Wahrhaftig, das muss ich gestehen, es geht doch nichts über den Wein!" ... "Ach, kommen Sie, Herr!" Nr. 15 Arie: "Wenn der Freude Tränen fließen"
Nr. 16 Quartett: "Ach, Belmonte! Ach, mein Leben!" "O Konstanze, je näher der Augenblick kommt"
Nr. 17 Arie: "Ich baue ganz auf deine Stärke"
"Alles liegt auf dem Ohr" ... Nr. 18 Romanze: "In Mohrenland gefangen war"
"Wie ängstlich schlägt mein Herz " ... "Blondchen? Blondchen? Gift und Dolch!" Nr. 19 Arie: "Ho, wie will ich triumphieren"
Nr. 20 Rezitativ und Duett: "Welch ein Geschick! O Qual der Seele!" "Nun, zitterst du? Erwartest du dein Urteil?" Nr. 21a Vaudeville: "Nie werd' ich deine Huld verkennen"
Nr. 21b Chor der Janitscharen: "Bassa Selim lebe lange"
. . . this operatic Turkish comedy fizzes with charm and virtuosity . . . sparkling and persuasively sung . . . [Diana Damrau's Konstanze] delivers the best "Martern aller Arten" I've heard for yonks: a delicious compendium of tangled emotions, gloriously matched by virtuosic instrumental playing from the principals of the Chamber Orchestra of Europe . . . Singing with great sensuality and perhaps even flutier top notes than Damrau musters, Anna Prohaska makes a spirited Blonde and she is well-matched by Franz-Josef Selig's Osmin . . . [Rolando Villazón] sings Belmonte with bluff vigour and a fine, metallic ring to the voice; you can believe that this lover really has the ardour and charisma . . . [Nézet-Séguin has a talent] for accompanying singers and the ensembles fizz with drama and exuberance.
. . . [Nézet-Séguin's "Entführung" interpretation,] while enjoying the exoticism of instrumentation, brings emotional and psychological depth to the composer's Turkish adventure. With Villazón as a refined Belmonte, the spellbinding Diana Damrau as a complex and intelligent Konstanze, and Anna Prohaska as a sympathetic Blonde, this starry cast even has the luxury of bass-baritone Thomas Quasthoff dignified and attractive in the speaking role of the Pasha Selim. A voluptuous spread. All told, this is the most satisfactory instalment so far of DG's projected recordings of the seven mature Mozart operas, all starring Villazón . . . he is in better voice than I have heard him for a long time, and his accented German is always clear. Belmonte is arguably the composer's most taxing tenor role . . . [but Villazón surmounts the difficulties with more than credit] . . . . Damrau makes light of Konstanze's bravura challenges . . . Anna Prohaska and Paul Schweinester are an attractive comic pair, Franz-Josef Selig is the best Osmin on disc since Kurt Moll . . . Thomas Quasthoff delivers the speaking role of the Pasha in sonorous tones. The set's success is guaranteed by Nézet-Séguin's airy conducting of a full edition, while the COE's wind soloists gratefully embrace the parts Mozart lavishes on them. "Die Entführung" famously requires two top-drawer coloratura sopranos, and Nézet-Séguin has struck gold on both counts. With her flexible silvery tone and diamond-bright upper extension Diana Damrau is pretty much my ideal in the demanding role of Konstanze, switching from fire to ice in a heartbeat and as compelling in the long-breathed lines of the great lament "Traurigkeit" as she is in the defiant pyrotechnics of "Martern aller Arten". Glorious playing, too, from the Chamber Orchestra of Europe . . . Prohaska eschews arch simpering in favour of a cool, no-nonsense imperiousness that audibly takes the wind out of Osmin's attempts to dominate her. The deceptively fiendish "Durch Zärtlichkeit" . . . is despatched with total insouciance, staccato top Es sounding as natural as breathing . . . [Rolando Villazón's full-throttle Belmonte sounds] like he's capable of the necessary derring-do to storm the Pasha's harem . . . he packs a welcome punch in the ensembles . . . Paul Schweinester impresses hugely as Pedrillo . . . What a luxury it is to have the great German bass-baritone Thomas Quasthoff . . . his gravitas and sudden flashes of anger had me gripped throughout. He has an imposing if unusually cultivated-sounding henchman in the distinguished Wagnerian Franz-Josef Selig's resonant Osmin, firmly sung even in the role's lowest reaches . . . and his chalk-and-cheese sparring with Prohaska in their duet is a delight.
. . . interesting, but never exaggerated musicianship. The tenor Rolando Villazón is a fixture and features here as a vivid Belmonte . . . Anna Prohaska's Blonde, Paul Schweinester's Pedrillo, Franz-Josef Selig's Osmin and Thomas Quasthoff's Selim -- are keen personalities and all well cast. Mozart performed with spirit is always a tonic. Once again, Nézet-Séguin shows how good he is in Mozart. His speeds are well judged, never too fast for the singers to articulate clearly. And he has the knack of bringing out detail without sounding fussy . . . Particularly beguiling is the oboist's rubato . . . The orchestra is beautifully balanced, with a fortepiano tinkling discreetly in the background. In his first German role, Villazón sounds assured, both in speech and in song . . . [interestingly, he makes] the wimpish Belmonte sound positively heroic. The coloratura in "Ich baue ganz" is very well done, with superb breath control . . . [Diana Damrau] also has no trouble with the coloratura and her latter two arias] are faultless. The sadness of the first is touchingly conveyed through her soft singing . . . before launching into the bravura of "Martern aller Arten". Anna Prohaska gives a winning account of "Durch Zärtlichkeit", soaring up to top E with no sense of strain . . . [the role of Blonde] presents many challenges, and Prohaska meets them all. Paul Schweinester is equally adept as Pedrillo, striking just the right balance between courage and fear in "Frisch zum Kampfe!". Franz-Josef Selig makes a superb Osmin, both formidable and comic, rich in tone across a range of more than two octaves. All the cast deliver the spoken words convincingly: none more so than Thomas Quasthoff as a passionate Selim . . . [this new recording] will do very nicely. Thanks to conductor Yannick Nézet-Séguin's energy, this disc is among the finest recordings of Mozart's youthful comedy . . . The casting is largely excellent . . . [Diana Damrau makes an imperious Konstanze,] sparkling in tone and fluent of coloratura in "Martern aller Arten" . . . Anna Prohaska sounds every bit her mistress' equal. Franz-Josef Selig strikes just the right balance between comedy and menace as the gardener Osmin, and Thomas Quasthoff speaks Pasha Selim's role in the dialogues with dignity and poise . . . However, what lifts the recording into the top league is undoubtedly the quality of Yannick Nézet-Séguin's conducting. From the first bars of the playful overture, he captures all the score's bravado and energy, keeping up an urgent pace without ever pushing phrases out of shape or leaving the singers breathless. The Chamber Orchestra of Europe provides him with beautifully blended playing throughout . . .
. . . his finest recorded outing as a Mozartean . . . [Nézet-Séguin's rhythmically alert and informed conducting] draws the listener into this performance . . . [the Chamber Orchestra of Europe play] with effervescence that flows from the start of the Overture to the opera's last bar . . . Thomas Quasthoff speaks one of the finest accounts of Bassa Selim on disc . . . [Franz-Josef Selig] voices Osmin's music handsomely and effectively . . . Schweinester makes Pedrillo's Act Two aria "Frisch zum Kampfe! frisch zum Streite!" a joy, his trill and long-held top A heard with great pleasure . . . Prohaska ascends into the stratosphere with little evidence of effort and a heartening avoidance of shrillness . 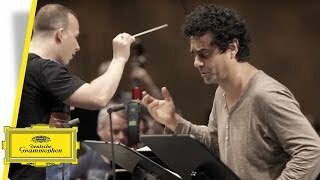 . . Villazón sets the high standard for the performance with a lovely, lively reading of Belmonte's aria "Hier soll ich dich denn sehen" . . . The indubitably great Damrau emerges in the much-feared aria "Martern aller Arten", her technical aplomb in the runs frequently cresting on top C dizzying, and she here rises to top D without a care in the world . . .
. . . Nézet-Séguin shows a masterly sense of when to press forward and when to ease up. Another aspect of his conducting is the insistence on sharp, almost Beethovenian dynamic contrasts. This may be a small orchestra, but it has plenty of power when the drama requires it. Rolando Villazon is an opera singer who puts his heart and soul into every performance . . . Villazon offers a far more multi-faceted Belmonte than we are used to hearing. Diana Damrau as Konstanze sails through some of the most difficult music Mozart ever wrote for a soprano with absolute security. Anna Prohaska as Blonde has plenty of demanding top notes of her own to contend with, and she too is wonderful. In fact, the entire cast of six could hardly be better. Talk about luxury casting . . . [Thomas Quasthoff] is excellent here in the speaking role of Pasha Selim. The Muslim leader becomes a real person in this performance . . .
. . . [Diana Damrau] displays the gifts that have taken her to the top of her profession . . . In "Entführung" she delivers a purposeful and exciting Konstanze, her tone gleaming, her technique solid and her dialogue impassioned. Her tenor, Rolando Villazón, has a voice perfectly suited to Mozart . . . The remaining cast is fine and capable . . . Yannick Nézet-Séguin's thoughtful conducting generally allows the music to unfold naturally . . .
. . . there is some passionate singing here, as well as sparkling instrumental detail -- the overture, for example, is full of witty contrasts and transparent textures . . . The cast is of a very high standard . . . [Villazón, as Belmonte, is] superbly lyrical . . . Diana Damrau (Konstanze) is at her very best in the defiant aria "Martern aller Arten", sustaining the intensity and high notes with ease . . . Franz-Josef Selig (as Osmin) has a rich and characterful voice, and his sparring partner Paul Schweinester (as Pedrillo) matches his mood changes and intricate tempo fluctuations perfectly. Also, we get some very effective singing from Anna Prohaska as Blonde who reaches her high E in "Durch Zärtlichkeit" with aplomb . . . The attacks are swift and sharp, the use of the piccolo is clear and brilliant, the emphasis on the Janissary music is bright and shiny. We hear a pianoforte clinking away unobtrusively. And throughout, we hear orchestral niceties. Mozart's marvelous woodwind scoring is at its most beguiling here, both upfront and in second voices, and Nézet-Séguin also seems to love his singers, giving them plenty of room and breathing with them (in an opera that requires the most diligent breath control imaginable). He leads it like the comic opera it is, with verve a-plenty, and one senses the young Mozart blossoming . . . [Villazón]: Note for note he's impeccable, placing just the right longing into each moment of "O wie ängstlich", right on the money in the terzett that closes Act 1, managing the coloratura and long breaths in "Ich baue ganz" with poise and ease, and singing with fine German diction . . . [Damrau's] Konstanze must be heard as a blazing success: fluent in coloratura, fearless, and presenting a strong woman who stands up to Selim. She sings "Martern aller arten" effortlessly. Anna Prohaska in the can-be-annoying role of Blonde manages to charm, and the ridiculous high Es do not sound as much like stunts as they can. She's clearly her mistress' equal-fierce and funny. Franz-Josef Selig makes a superb Osmin . . . his agile and pitch-black voice able to express both Osmin's silliness and nastiness, with remarkable low notes (that really are notes -- even the D) and easy bounces back up to the staff two octaves later . . . Thomas Quasthoff's Selim is by turns scary, vicious, and eventually a pleasure. He's a terrific vocal actor . . . Yannick Nézet-Séguin is a great conductor.
. . . extremely well played, mostly well sung, convincingly acted, and reasonably paced by the conductor. . . the sonics strike me as excellent. The success in eliminating audience noise is marked . . . with a warm ambience that bespeaks a fine acoustic environment . . . [it is an affectionate performance,] presenting the story well. It is expressively sung and the dialogue seems just right -- not just from Thomas Quasthoff, who strikes the perfect note as the Pasha, but from all of the singers, who do their own dialogue. The matter of dialogue, both timbre and balance, is an important point in enjoyment of this work . . . But a great strength of this new release is that it is all of a piece in this respect, and the aural transition from song to speech and back is seamless . . . I find Villazón's assumption of Belmonte to be one of the better things about this recording. The voice has a burnished hue and, like most of the singers, he just gets better and more convincing as he goes along. His opening aria is well phrased and, later in act I, at "O wie ängstlich", he sings touchingly and is most expressive. Act II's "Wenn er Freude" is even more solidly vocalized, and he manages the difficulties of "Ich baue ganz" at the opening of act III extremely well . . . This recording features another excellent tenor in Paul Schweinester, whose Pedrillo is on balance as good as any . . . [Schweinester has the measure of the role's humor and positive nature] and he makes every musical and dramatic point . . . Anna Prohaska is a charming Blonde, often quite funny, and she sings as well, I should say, as any on record . . . With the role of Osmin the new release offers one of the finest vocal performances and dramatic characterizations I have heard in some time . . . [Franz-Josef Selig] has the measure of this role to the fullest. Perfectly balanced in the fine acoustic and never overdoing the role . . . His is a brilliant, expressive performance, beautifully sung . . . [Nézet-Séguin] secures absolutely first-rate playing from the Chamber Orchestra of Europe and they sound (in this acoustic) to be an ensemble of ample sonority and tonal amplitude . . . It is a somewhat Romantic performance, and Nézet-Séguin never fears to slow down or draw things out a bit to enable a singer to make a dramatic or vocal point. I like his reading . . . [this new "Entführung"] has a capable conductor and cast who convey their love of the score in every breath of this performance; a clean edition of the great score; a discrete, always audible, continuo; and sonics without flaw. This is a recording I can recommend for your enjoyment.
. . . Rolando Villazón offers a lesson in style: deft, legato delivery of fast passage work, impressive breath control and intelligent phrasing. Franz-Josef Selig negotiates the vast range of the comic bass role of Osmin with winning bluster. Anna Prohaska makes an ideally pert and sparkling Blonde; tenor Paul Schweinester, a funny, wimpy Pedrillo. Thomas Quasthoff brings unusual intensity to the Pasha Selim's spoken lines.
. . . [the singing is] simply glorious, making for a first choice among previous releases . . . The outright triumph belongs to Diana Damrau's Konstanze, which is fully dramatized and sung with authority . . .This is a modern, psychologically realistic Konstanze, which Damrau may be uniquely placed to sing right now. She gives us a complete portrait in the whole scene surrounding "Martern aller Arten", and the aria itself is fiery and thrilling . . . Anna Prohaska's Blonde is feisty . . . she exhibits brave coloratura heading up to a high E in "Durch Zärtlichkeit und Schmeicheln" . . . [Paul Schweinester] is an appealing vocal actor, and his defiant military aria, "Frisch zum Kampfe", is a scene stealer. As Osmin, bass Franz-Josef Selig is also outstanding. His big, smooth, rolling tone easily encompasses the role's wide range. The sound is beautiful, and Selig really throws himself into Osmin's ridiculous savagery. Finally, in the spoken role of Selim, the great Thomas Quasthoff makes the lovelorn pasha sympathetic and noble . . . thoroughly successful . . .
Eine feste Größe ist . . . der Dirigent, der quirlige Yannick Nézet-Séguin, und das Chamber Orchestra of Europe, das zuverlässig für historisch informierten Klang sorgt sowie das Rastatter Vokalensemble mit seinem homogen kernigen Sound . . . [Villazón]: [ungebrochen] seine sympathische Ausstrahlung in den Dialogen, wo er gezielt mit spanischem Zungenschlag spielte. Mit Diana Damrau stand ihm eine Konstanze zur Seite, wie sie gegenwärtig nur schwer nochmals zu finden sein wird. Über ihre wie naturgegeben wirkende technische Souveränität hinaus gelang es ihr, die emotionalen Facetten dieser Rolle beeindruckend auszugestalten. In der Martenarie bot sie kraftvolle Dramatik, das Wechselbad der Gefühle in der ersten Arie "Ach ich liebte, war so glücklich" stellte sie packend aus, im einleitenden Adagio die innere Unruhe durch leichte Rückungen des Tempos, dann in den Koloraturen durch ruhelose Dramatik, bis die Stimmfärbung auf dem Wort "Kummer" den Schmerz schier fühlbar werden ließ. Durch Damraus einfühlsame Gestaltung wurde aber das g-Moll-Lamento "Traurigkeit ward mir zum Lose" im 2. Akt zum absoluten Höhepunkt der ganzen Aufführung -- Ausdrucksgesang auf allerhöchstem Niveau. Dass diese Geschichte einer Befreiungsaktion aus dem Morgenland nicht nur ernste Seiten hat, sondern auch handfest komische, dafür sind ja die drei übrigen Protagonisten zuständig. Hier war mit kernigem Bass Franz-Josef Selig als Osmin eine Glanzbesetzung. Weniger als polternder Unhold legte er seine Rolle an, sondern würzte sie mit einem Quäntchen (Selbst-)Ironie. Durchaus auf Augenhöhe parierte als Pedrillo Paul Schweinester im Bachus-Duett. Der junge Sänger fügte sich überhaupt mit agil geführter Stimme angenehm in das Ensemble ein. Eine selbstbewusste und couragierte Blonde, stellte dabei mit erfrischend komödiantischem Einschlag Anna Prohaska dar. Auch sie bot dem rückständigen Frauenbild des türkischen Haremswächters stimmlich kräftig Paroli . . . Nézet-Séguin dirigierte mit temperamentvoller Zeichengebung. Auch die feinsten Nuancen in Phrasierung und Dynamik modellierte er heraus und das Orchester setzte dies in eloquente Klangrede um. Das Klangbild war transparent und plastisch. Einen besonderen Effekt erzielte die Gruppe der obligaten Begleitinstrumente, die sich zur Marternarie um die Konzertmeisterin gesondert gruppiert hatte. Gerade auch die enorme instrumentale Farbigkeit war einer der großen Pluspunkte dieser Aufführung und trug zu ihrem großen Erfolg wesentlich bei. Fazit: Verdienter Jubel für alle Beteiligten und ein Hoch auf das bisweilen etwas unterschätze Singspiel aus Mozarts Feder. Die Ouvertüre gelingt mit großartiger Schlagkraft und Kontrasttiefe . . . [Nézet-Séguin holt] aus dem Chamber Orchestra of Europe bemerkenswerte Intensitäten, instrumentale Farbwunder und emotionale Schattierungen heraus. Und er lässt sich Zeit, agiert mit sorgfältiger Liebe zum Detail . . . in Konstanzes Martern-Arie etwa scheint die Zeit geradezu zum Stillstand zu kommen . . . Diana Damrau als Konstanze scheint hier auf dem Weg zur Heroine á la Lucia di Lammermoor . . . [zudem] eine ausgezeichnete Anna Prohaska als Blonde und ein großartig präsenter Franz-Josef Selig als Osmin. Nach einem begeisternden "Don Giovanni" . . . nun also "Die Entführung aus dem Serail" mit dem Gespann Yannick Nézet-Séguin (der hier wieder zu seiner "Giovanni"-Form aufläuft) und Rolando Villazón. Der Mexikaner hinterlässt hier [den bisher besten Eindruck] . . . Diana Damrau steht alles zu Gebote, was man für die Konstanze braucht . . . Anna Prohaska steuert eine sehr gut gesungene [Blonde bei] . . . Dazu gesellen sich der frische, unverkrampfte Pedrillo von Paul Schweinester und Franz-Josef Seligs schlanker, beweglicher Osmin.
. . . [la jubilation vient des jeunes chanteurs] et aussi de la direction du chef Nézet Seguin: les deux jeunes tempéraments que sont Pedrillo (le ténor tyrolien Paul Schweinester) et Blonde (Anna Prohaska) . . . ils sont doués d'une profondeur et d'une vérité inédite que Mozart a fouillé de facon aussi géniale qu'inattendue . . . la grâce comique de ce Pedrillo irrésistible; l'engagement hyperfeminin et séducteur de Blonde font la valeur de cette lecture incarnée . . . [Nézet-Séguin] détaille la brillante parure orchestrale que Mozart a concu pour chaque épisode; en jouant constamment l'écoute chambriste, le délicat équilibre entre voix et instruments, le chef relève les défis d'une partition raffinée, subtile, palpitante . . . Les ensembles de choeur ou entre les solistes sont ciselés; l'ajout du pianoforte dans les récitatifs ajoute au raffinement sonore qui coule ici comme une onde riche et percutante . . . Le mouvement général, le sens du théâtre, la bouillonnante énergie de la comédie turque, trop dotée en notes, où perce la vitalité des janissaires (entre autres) sont très convaincants.
. . . une pure joie . . . la Konstanze de Diana Damrau frôle l'idéal. Quelle énergie dans l'accent, quelle facilité dans les vocalises, quel rayonnement dans le suraigu! Blessée, traumatisée, déchirée, cette jeune femme aura du mal à oublier ce qu'elle a vécu dans le sérail . . . [en Pacha Selim,] nous retrouvons le timbre unique de Thomas Quasthoff. Même dans ce rôle parlé il fascine grâce au charisme si particulier de cette voix, capable de mille et une nuances. Au pupitre d'un brillant Chamber Orchestra of Europe, Yannick Nézet-Séguin fait entendre une lecture à la fois vivace et nuancé, tour à tour, charmante, agressive et sensible. Quelle joie! Wolfgang Nézet-Séguin! . . . une superbe brochette de stars côté gosier. Un enlèvement qui ravit . . . la version de Yannick Nézet-Séguin est une réussite totale, et s'inscrit durablement dans la discographie moderne de l'ouvrage . . . [Nézet-Séguin] parvient à résoudre la quadrature du cercle à l'opéra, qui est d'enflammer l'action tout en tenant, et de quelle manière, la ligne musicale. Tout s'écoule avec fluidité et naturel, dans des tempi rapides, et la perfection de la mise en place n'est jamais prise en défaut. La baguette sait s'alanguir juste autant qu'il faut pour mettre en valeur la délicatesse des bois du Chamber Orchestra of Europe. "Ich baue ganz auf deine Stärke" est un très bel exemple de ce mélange vie dramatique/raffinement musical, mais on pourrait multiplier les citations . . . [Villazon's] Belmonte est à marquer d'une pierre blanche. Santé vocale éclatante, allemand impeccable . . . , investissement dramatique, tenue de la ligne, souffle infini, aisance dans les vocalises . . . Rien ne manque. Diane Damrau est elle aussi excellente et très à l'aise dans l'écriture colorature de son rôle . . . un des plus beaux coffrets Mozart de l'époque moderne, à acquérir d'urgence.